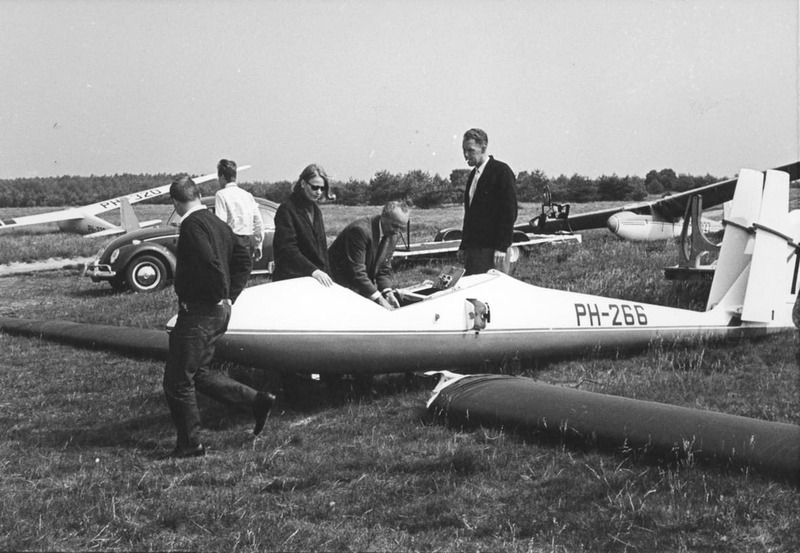 The Sagitta (Arrow) was the first – and last- single seat standard class glider design in Holland. Piet Alsema used three years planning and research before the first prototype flew on the 4th of July 1960. Even today the glider looks slick with its slender all-wood fuselage with raked fin and rudder, long pointed nose and sliding blown canopy which provides excellent all-round visibility. Tailplane and elevators are completely wood and consist of two separate pieces connected together with male/female spar and one vertical centre pin. The prototype had tailplanes that could be folded upwards for transportation. The relatively small wheel is fitted with a drum brake, activated by a lever on the control stick. The two piece wing has a single spar made of spruce and about 25% of the wing is covered by fabric. The ailerons are plain wood and the uniquely constructed airbrakes open both from the upper and lower wing surfaces. The fuselage is of a relatively light construction, while the wings with their extremely strong spruce spars and wooden ailerons are quite heavy constructed. A lot of things changed from the prototype (s/n 001, registration PH-266) to the serial produced glider. 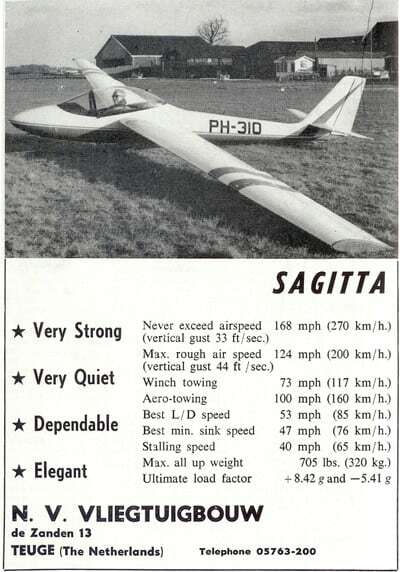 The first serial built Sagitta was called Sagitta 2 (s/n 002, registration PH-280). All Sagittas after s/n 013 are called Sagitta 013, because it was only then the Sagitta was fully certified. 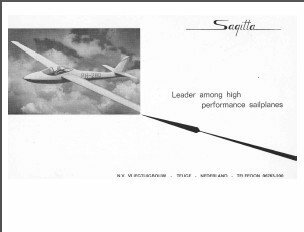 The Sagitta has always been a heavy glider, due to the fact that it is build according to the very strict Dutch airworthiness requirements; probably the most demanding in the world. The wing spars are built from solid spruce and both wings and fuselage are covered with birch ply. At one stage, probably after test flights, the wing tip profile was changed from NACA63-618 (over the whole wing) to NACA-4412, in order to make the tips stall later than the rest of the wing and thus keeping aileron control longer. We know now that this wasn’t too successful. One other change was in shape and construction of the canopy. Sagitta 001 is the only one with the very long nose, which makes it really different from the rest. However, we don’t know more than what we can see on the pictures that are available. The prototype also had tailplanes that folded upwards for transportation. This explains maybe why the tailplane can be hard to get rigged on the later versions (with a main pin through the tail fin); it was simply never designed like that originally. With the modification of the tailplane also the shape and size of the rudder changed significantly. See picture galleries and note the difference between s/n 001 and all other Sagitta’s. The wings connected to the fuselage automatically with a sort of fork construction. Some other details about the prototype are to be found in this article. Note: Vne has been tested up to 300 km/h (162 knots) but was later lowered significantly in most countries, and empty weight increased caused by several important safety modifications. Note 2: according to Louis van Rijn tests have been flown up to 360 km/h (194 kts). The Super Sagitta 17 meter version (only one built) features a larger rudder and a one-piece tailplane (which rigs like the Standard Libelle). It has a trim surface that connects automatically. The Schempp Hirth airbrakes are built in from the factory. Note about the span: all series produced Sagittas are 14.74 meter. This is caused by the use of a “flat” tip element; originally it was round on the prototype. Some thoughts about the technical causes of quite a few accidents,by Louis van Rijn. After a while, when practical flight results came available, it became evident that the Sagitta didn’t weigh up to its promises. So What exactly was the cause for the disappointment in aerodynamic characteristics, especially the stall characteristics in slow turns? This was a typical cause for agressive spinning with often fatal results. Even though the Ka-6 and the Sagitta share the same wing profile at the root, they do differ at the tip. The Ka-6 ends up in the old Joukovsky, while the Sagitta has NACA-4412 (or 4415) at the wing tips. It is obvious that at low Reynolds numbers the NACA profile has more drag than the Joukovsky profile. Reynolds numbers are an expression of the wing chord x speed, divided by viscosity. The Reynolds numbers for Ka-6 and Sagitta are around 0.5 to 0.7 E+6. Also the CI-Max is lower in comparison with Joukovsky.